Hostal Bianco is located in central Madrid, just 400 metres from Puerta del Sol and the Thyssen-Bornemisza Museum. It offers a 24-hour reception and air-conditioned rooms with free Wi-Fi. The rooms at the Bianco feature tiled floors and simple décor. Each one has a flat-screen TV and a private bathroom. Rooms feature a free tea and coffee maker. Staff at reception can provide information about what to see and do in Madrid. There is a luggage storage facility at the front desk. The Prado and Reina Sofía Museums are within a 10-minute walk. You can walk to the charming Retiro Park in under 15 minutes. Make yourself at home in one of the 17 air-conditioned rooms featuring LCD televisions. Complimentary wireless Internet access is available to keep you connected. Bathrooms have showers and complimentary toiletries. Conveniences include blackout drapes/curtains, and housekeeping is provided daily. Make yourself at home in one of the 17 air-conditioned guestrooms. Complimentary wireless Internet access is available to keep you connected. Pensión Magdalena is just 100 metres from Antón Martín Metro Station in central Madrid. Puerta del Sol is 8 minutes’ walk away, and you can walk to Atocha Train Station in 10 minutes. The air-conditioned rooms at the Magdalena feature simple décor, central heating and a fan. Each has a flat-screen TV and a private bathroom. Staff at reception can provide information about what to see and do in Madrid. The charming Retiro Park is around 10 minutes’ walk from Pensión Magdalena, and the lively Huertas Street is just 350 metres away. You can walk to the Prado, Reina Sofía and Thyssen Museums in around 10 minutes. Hostal Santa Isabel can be found just a few minutes’ walk from the Reina Sofia gallery and Atocha Station. It has free Wi-Fi in all rooms. All of the rooms in Santa Isabel have air conditioning. They also have balconies. All have a full bathroom, heating and a TV. The Hostal Santa Isabel is open 24 hours a day. The nearest Metro station is Anton Martin, on line 1. From here it is just 2 stops to Puerta del Sol. Atocha Station is about 500 metres away. From here you can get a train to outside Madrid. Barajas Airport can be reached in about 20 minutes by car or taxi. With a stay at Ok Hostel Madrid, you'll be centrally located in Madrid, within a 5-minute walk of Puerta del Sol and Teatro Nuevo Apolo. 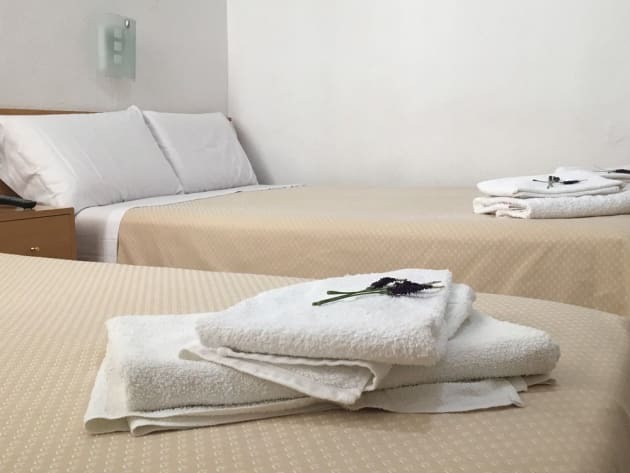 This hostel is 0.4 mi (0.6 km) from Plaza Mayor and 0.5 mi (0.8 km) from Puerta del Sol.